In two words: Went. Well. In two other words: Got. Results. Neither of us did any running. I had a reason. See Previous Entry. HCRP . . . He can start his own blog. We have different reasons for adopting this new eating style he and I. Mine is to basically ‘clean up’ my vegetarian diet by eliminating grains, legumes, (limited) dairy, and (what few) sugars I consume. In reality the legumes and brown rice have been the biggest challenge since, like most vegetarians, I have replaced much of my meat consumption with the legume/grain combination as a protein source. Oh, and I miss my Greek Yogurt. And cheese. Not that I ate a lot of it, but I do miss my cheesy little boyfriend Colby Jack. This morning as I was showering I heard the telltale *beeep* of the scale firing up and thought it a tad odd for him to be weighing in between Tuesdays (he generally doesn’t) but didn’t say anything about it. We’re taking part in a class at our church that meets on Saturday mornings. At the start of each class we go around the group and share the good that has gone on in our lives in the past week. We went around the group and when it came HCRP’s turn nobody was more surprised than me when he spoke. This past week, with zero running/working out (don’t judge him – I’ve kept him busy assisting me with final plans for My 5K) he lost four pounds! I didn’t say much at the time, but a few minutes ago I sauntered into the living room and asked if he was convinced that this Paleo Diet was going to work. He agreed that yes, it was. Score One for The Cave Woman! The only – and I mean o-n-l-y – way to succeed on this particular Eating Plan is best summed up in the word “Plan”. As in Meal/Menu Planning. Which is how I’ve spent my afternoon. And as soon as I figure out how I’m doing all of it I am more than happy to share recipes. Actually the only thing to “figure out” is the Avocado Dressing. The rest if it is just sprinkling spices and drizzling either olive or coconut oil. Le Knee has been Le Pain Free for a good couple Le Days, so I am hopeful that Monday after work I’ll get in a good, one mile run. My Plan Of Action is to walk 1/4 mile, run (slow and easy) 1/4 mile, walk 1/4 mile, run 1/4 mile. My 5K is next Saturday. This time next week it will be All Over but The Dust Settling and cutting the check to The Ronald McDonald House. Until May 1st when we begin planning for next year’s event. I’m already planning to expand the event to include a 10K. Never rest on your laurels, especially when you don’t even have them yet. Oh, speaking of Unrested On Laurels check this out! This is Your Intrepid Middle-Aged Woman Blogger wearing a Size 12 Dress that has languished in a box marked “Skinny Dresses” in the eight (that’s ‘8’ in number years) years since YIM-AWB was last able to fit into it. 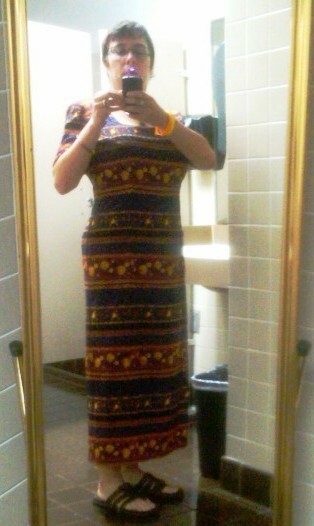 YIM-AWB has missed wearing This Dress. YIM-AWB is very happy to be back in this dress. YIM-AWB, before actually seeing herself zipped into This Dress was just certain she was still “too fat for” one of the “Skinny Dresses”. She was, apparently, quite inaccurate in her assessment of her own size and shape. YIM-AWB is, in a break from long-held custom, quite happy to have been proven wrong mistaken. YIM-AWB would also like to point out to One And All the flat, well-cushioned, supportive footwear at the bottom of This Dress. Yes, she has Learned Her Lesson.